Every parent longs for peace. But kids argue with each other. And we’re often left not knowing what to do to gain the peace we long for. Parenting shouldn’t be this confusing and frustrating. The If-Then Chart, designed by real parents with real kids, has been helping parents bring peace to their homes for over 26 years! God has given us all we need to confidently train our children – in His Word – and this simple tool helps bring that Word to bear on our everyday parenting challenges. You choose consequences for each of the 10 common childhood sins and fill in the right-hand column of your chart. What did he just do? What does God say about what he did? What have you agreed will happen when he does this? You will know what to do, and your children will know what to expect. It’s a simple tool that helps you be the kind of parent you want to be. Prompt, consistent discipline restores fellowship so you spend less time being frustrated or confused, and more time enjoying your children. When your children misbehave (which won't happen as often! 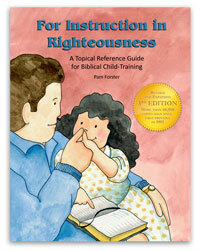 ), you'll be prepared to teach them about God's standards and point them to the Gospel. Choose from the small, laminated chart or a larger, un-laminated poster. Each version includes instructions for using your chart and suggestions for filling it out. What's new in the updated If-Then Chart? Two new, convenient formats available (large full-color posters and digital downloads)! Scripture quotations are from the ESV Bible. Spanish translation available upon request. Have used this for 15 years. LOVE that the consequences are able to be personalized for each family..and for different stages in each family. Consequences for a 3 year old are vastly different than those for a 13 year old. This chart "grows" with your family. This chart has given us the tool we needed to get our discipline in-check. It kept my husband & I on the same page when giving consequences for our children's behavior. The children got familiar with it very quickly & it seemed effective for our family. It is adaptable to each family's style & is erasable. I would recommend this to parents. I used my If Then chart for years with my three children. It was a great way to set out the expectations and consequences. Sometimes in the heat of misbehavior, it is hard to be consistent, but the chart lets you step back, take a breath and look at the consequences to apply them rationally and consistently. Now we are using them for the next generation. 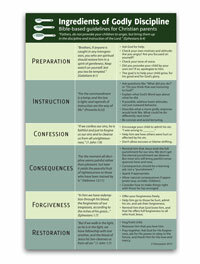 I purchased this chart and the "Blessings" chart to help me with giving my 4 year old and 2 year old a more tangible way of understanding their behavior in the lens of God's Word. At their ages, I have decided to use the empty boxes as a way to keep tally of how many times they did a good behavior (the Blessings chart, or as we call it the blue chart) and naughty behavior (if-then, or the yellow chart). Depending on the end of the day which chart had the most checks would determine reward or consequence. This has been SO helpful with my kids identifying their behaviors. They even tell me which chart they themselves and each other's behavior falls. I am SO glad I purchased these charts. When they get a bit older I will utilize the chart as directed. I just also purchased the "put on" study. I can not wait to see how that helps them learn tangibly how to put on the characteristics that God is pleased with. We are homeschoolers from a while back. Our son had major issues and I found this in a homeschool magazine (can't remember which one). I couldn't wait to get this in the mail. Wow! It certainly helped. The kids colored it in and we sat together to come up with the disciplinary actions to write in. He could no longer argue about it... he had helped come up with the consequences. Didn't think Doorposts was still around. So glad to have found it again. Number one...I now have a grandson who will need this in a few years. And a friend at church is struggling with a willful child. It's good to find an old friend again! Thank you Doorposts!!! Our family (and now several of our friend's families!) have greatly benefitted from use of this chart. It helps Dad & Mom to be on the same page with consequences. It has also helped me as a mom to stay consistent throughout the day as I can become frustrated and tempted to throw our unreasonable consequences for repeat offenders. Our kids know what to expect and receive their consequences better than before we started using this tool. It has also helped our kids in areas of behavior where we weren't seeing much progress before. Thanks for sharing this!! So Good We Don't Need It Anymore! 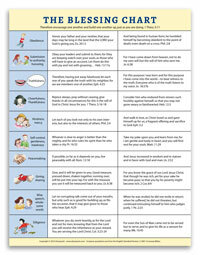 We found this chart so helpful in disciplining our son! In fact, it worked so well that we almost never use it anymore! Now we use the Blessing chart for rewarding good behavior--but we still keep the If-Then chart on the fridge just in case! 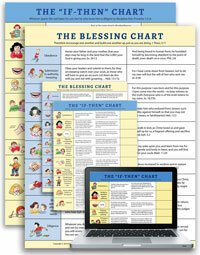 I used the If then chart and the Blessing chart with my children when they were young. I'm thrilled to say that my daughter now uses them with my grandchildren!Parents use what works! We love the If-Then Chart! It is awesome and we use it daily with our son. Each time he does something wrong, we take him to the chart and point out his sin and read the scripture that correlates with it. I love having something to go to and reference, it makes it so much easier when correcting him. I am so thankful that we have these they are a great blessing. We used the if then chart and the blessings chart. They are great tools to use and teaches our children the word of God through their actions. I recommend them to everyone to use. It also teaches our children that God deals with us in much of the same ways their parents deal with them. Thank you Doorposts for making these available when my children were small. 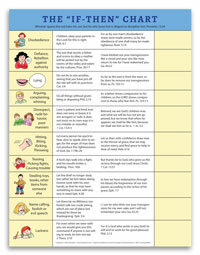 We started using the chart to help with whining and complaining when my son was 4 yrs old. We needed the chart to also help my husband and I to use the same consequence when correcting our son. I sat down with our son and we both helped come up with fair consequences. Now we all know what to expect and every since we started consistently and lovingly using the chart our son is recognizing his behavior and checking himself or asking Jesus to help him. I used this If-Then Chart when I was raising my children 15+ years ago. My daughter, is now 22 and has her first child who is 2 years old and one on the way. We were talking about this chart and how it help her and her brother when they were younger. She wished that I still had it. I was so pleased to see them on this site and for Christmas I am going to suprise her with this chart and the blessing chart, so she can use it with her children. She will be so excited. I had 7 children in 7&1/2 years. With my husband working and going to Bible College I needed something that would aid me in consistent discipline. I LOVE the if/then chart!! My family is in the process of working on our own "older" version, but the basics are still the same. I originally bought this chart when our oldest son was 2y/o, now 7. My husband was deployed for the first time and I needed some kind of Biblical Guideline for disciplining our son. We are still using the same chart for him and now our next 2 oldest, daughters 3 & 2y/o. I couldn't imagine a day without this chart in our house. Our son has been in AWANAs since he was 3, but he has almost every verse on this chart memorized just by going to it when he makes "Bad Choices". Thanks so much! This product is a blessing from God! It changed my children's behavior immediately. I told them about the blessing chart and they have never acted so wonderfully. They volunteered and did things before even asking them. And I just ordered the Blessing Chart today. We are very greatful to have had this chart to put in one place our decisions for discipline. It brings unity to the parents and allows the children to be warned in advance of the consequences. The scriptures are very helpful and handy to re-enforce the view the Lord God has on our conduct. THANK you for this tool! It has helped my husband and I "get on the same page" with consequences for disobedience. It's helped us be consistent with discipline handed out. I love the fact that the smaller one is laminated so consequences can be changed as the children age etc. This chart has helped our family so much! There were many times I would find myself not disciplining because I didn't know what actions to take. This helps me stay on target. My children also like knowing what will happen. It provides consistent discipline. The verses also have helped us with our Bible memory! Thank you! We came across the If-Then chart a conference with the Maxwell Family. I is truly a blessing. Not only was it good the children, but for mon and dad. It provided consistancy and helped eliminate the emotion from disciline. We are so grateful!! The Lord used the "if-then" chart to answer the desperate prayer of a young mother who was newly saved in the early nineties. "Please," I asked Him, "show me how to raise them Your way." I was desperate. The old worldly disciplinary tactics of threats and temper loss were exasperating and impotent. We all knew that my inconsistent responses were largely dependant on my moods. The "if-then" chart revolutionized our family almost over night. Suddenly we could go to the store - or anywhere for that matter, and actually enjoy having our children along. They thrived on the Bible based security and consistency. People everywhere asked why our children got along so well and never fought or disobeyed. Well, we just decided to do it by "the Book"! We shared the chart with many desperate parents. It's so simple really, just do what God says in His Word. The chart simply organizes and presents it clearly for your children to grasp more easily. Well those children are 18 and 20 years old now. Both have trusted in the Lord for themselves and are currently planning to use "The Chart" for their own children when the time comes! I am so thankful that you are still offering it. Thank you for your faithful ministry all these years. The fruit just keeps on coming! I bought the If-Then chart in the late 90's when my oldest two were small (they're 11 & 13 now). It was a great blessing for all the reasons others have said--consistency for parents, Bible verses, no emotional decisions to make. Now we have it out again (we've moved a few times since then) since we found our younger children aren't as obedient as the older ones were. Well, it still works! And tonight I'm e-mailing the link to a friend who's asking for discipline help. Sure glad to find you're still here, Doorposts! Thanks for making such great products! I was at a friend's house and when it came time to discipline her child, she brought him to the chart and read the Scripture verse. Then the child(4) asked,"How many spankings,Mom." I was so IMPRESSED at how respectful and controlled this was that I'm now online buying one. How neat to use Scripture, have a set consequence, and not just rely on emotions. This will change our family and already has without the chart, though I think the chart is a must to keep everyone accountable. A good friend recommended the if/then chart. I have a 4,3, and 19 month old. It has been great with our oldest 2. No more deciding what the consequence should be - it's on the chart. It not only holds the children accountable, but my husband and I as well. And we know that the only true change can come through the Word and disciplining their hearts. Thank you!